Podcasts are digital medium for RSS feeds. 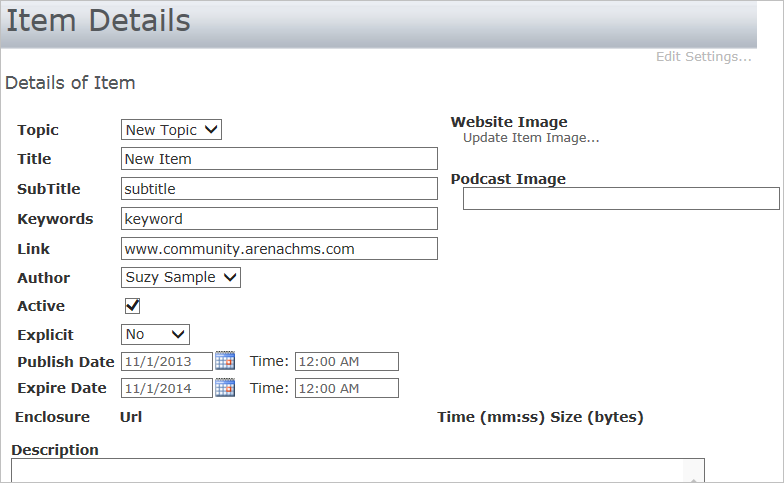 After Feed Formats are created, you can create Podcast Channels on this page to be available on your Arena-managed external website. 1. Click the Add New Channel icon. 2. On the Details tab, enter all applicable information for this channel. 3. Enter a title for the podcast channel. 4. Enter a subtitle for the podcast channel. 5. Enter the URL link for the podcast. 6. Enter an author for the podcast channel. 7. Enter a contact name for the podcast channel. 8. Enter a contact email for the podcast channel. 9. Enter a copyright information to display for the podcast channel. 10. Enter the language for the podcast channel. 11. Enter a comma-delimited list of category(s) for the podcast channel. 12. Enter a comma-delimited keyword(s) list for the podcast channel. 13. Select a content category for the podcast channel. 14. Select the Active check box to make this podcast channel available. 15. Select the explicit option for the podcast channel. Options are yes, no and clean. 16. Select the Context Aware check box for the podcast channel so that the podcast can adapt to the viewing environment. 17. 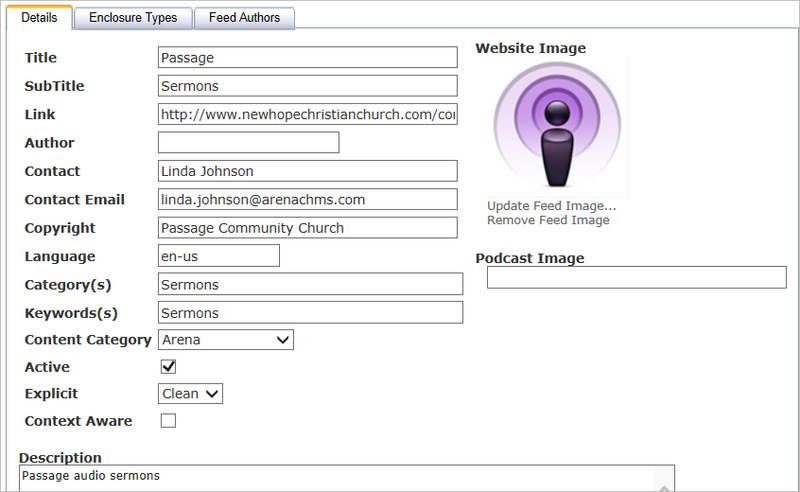 Upload an image for the podcast or enter the image file path in the Podcast Image field. The image displays on the external Arena-managed website page for the podcast. 18. Enter a description for the podcast channel. 19. Click the Enclosure Types tab. •Publish – Select this check box to select which Feed Formats to allow as enclosures for this channel (This example allows both Audio and Video). •Feed URL – Enter the URL of a public site that offers forwarding services to abstract the feed URL (FeedBurner is an example of such a service). This is available if the select Feed Format was setup for "Public Format", Arena allows you to point to the URL. 20. Click the Feed Authors tab. Use this tab to input the authors of the individual feeds for within this channel. 21. Click the Topic tab to add podcast topics. Topics are simple containers to group podcast items together for better organization. A list of topics created for a particular channel displays in a small window at the bottom of the Channel Details page. The only inputs are for a title and description of the topic, a check box for activation/deactivation, and an optional image upload for this particular topic. 22. Click the Update button. You can now add a Topic Item. Items are going to be the actual media files that are to be viewed for the podcasts. A list of them shows in a window at the bottom of the Topic Details page. 23. Click the Item tab to add a new item. •Topic – Select a topic. •Title – Enter a title to display for this item. •SubTitle – Enter a subtitle to display for this item. •Keywords – Enter a comma-separated list of keywords. •Link – Enter the link for this Topic. •Author – Enter the name to display as author of this item. •Active – Select this check box to activate/deactivate this item. •Explicit – Select description of the type of content in this item. •Publish Date – Enter the date and time to start making the item available publicly. •Expire Date – Enter the date and time to stop making item publicly available. •Enclosure/URL – Enter the publicly hosted URL that contains the actual file. The URL must be in the URL box for the appropriate Enclosure type. If you know the length of the clip, enter it in MM:SS format in the Time block. This time displays in the feed. The size information automatically fills when you click the Update button and the item is fully setup. Arena attempts to find the file at the provided URL, then pull the file size of the item and populate the Size field. •Podcast Image – Input URL for publicly hosted image to display for this item. 24. Click the Update button. 25. Select the Topic Title for the Topic Details page. Once the feeds, channels, topics and items are properly setup, the RSS feed is ready to publish your podcasts. Each unique channel/feed combination is going to have its own RSS feed for which users can subscribe. The screenshot below shows this relationship.